Today I am posting my first on the FPN but I must say, being a silent member for over a year, I have really enjoyed reading the Montbanc posts and following the people who post more frequently. I got my first Montblanc two years ago when I was 18. It was the Montblanc 147 75th Passion and Soul edition with an EF nib and it is still in my rotation. Today I am writing to you all with a question about two of my Montblanc Noir et Noir Fountain Pens. I have to admit that at the time of purchase of my first Noir et Noir, I was under the assumption that it was a Boheme until I realized that there was an absent ring fitting below the threads. 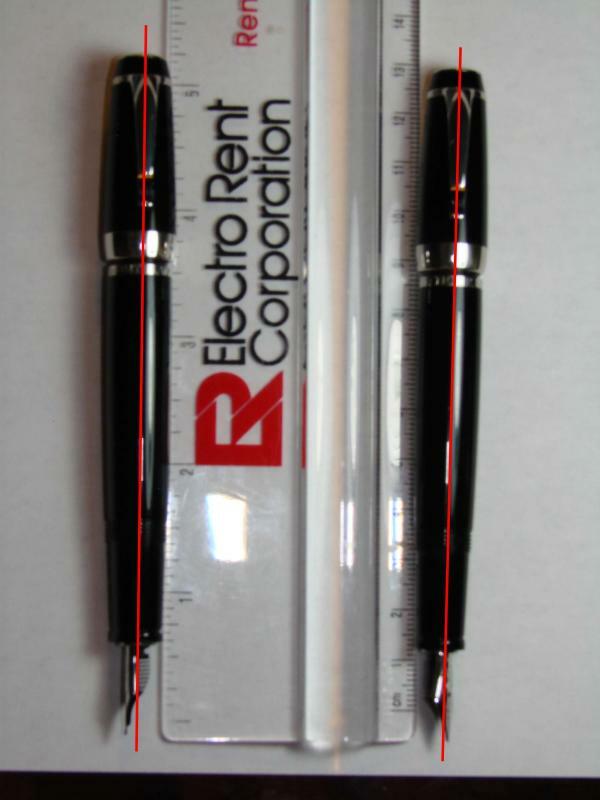 With further examination, I noticed that the ring at the end of the pen where the cap posts did not say “Boheme” but instead “Noir et Noir.” It was then that I realized that I had stumbled upon the pen that preceded the Boheme but was later recalled by Montblanc due to copywrite infringement of the name “Noir et Noir.” I was pleasantly surprised when I read that! Unfortunately I over tightened the cap on the back of the pen and broke off the hinged piece where the ink cartridge goes. So early September I took a four hour drive down to the St. Petersburg to visit family and to drop of my Noir et Noir to be fixed along with my Czar Nikolai I Legrand FP which needed to be serviced. It was by luck that when I was down there I checked local CL Listings and found someone who was selling a broken Noir et Noir, coincidentally with the same problem mine had. So I ended up buying it from him and dropping three pens off at the Montblanc Boutique. Last Friday I received all three of my fountain pens back and all of them were functional again. There is just one detail on both the Noir et Noir that has been bothering me. When uncapping the pens and screwing them on the end for writing to retract the nib, neither clips line up with the nibs like I remember them to. So my question is, am I recalling this incorrectly or is the clip on the cap supposed to align with the nib when posted for writing? To me this is a very important detail because without the cap posted the Noir Et Noir is much smaller and almost unbearable to write with and that is why I would think Montblanc would have taken the time to align this correctly. In closing, we all love Montblanc because of their fine attention to detail and I would hate to think that Montblanc has a technician who is so carless and sloppy not to check to see if the pens post correctly. 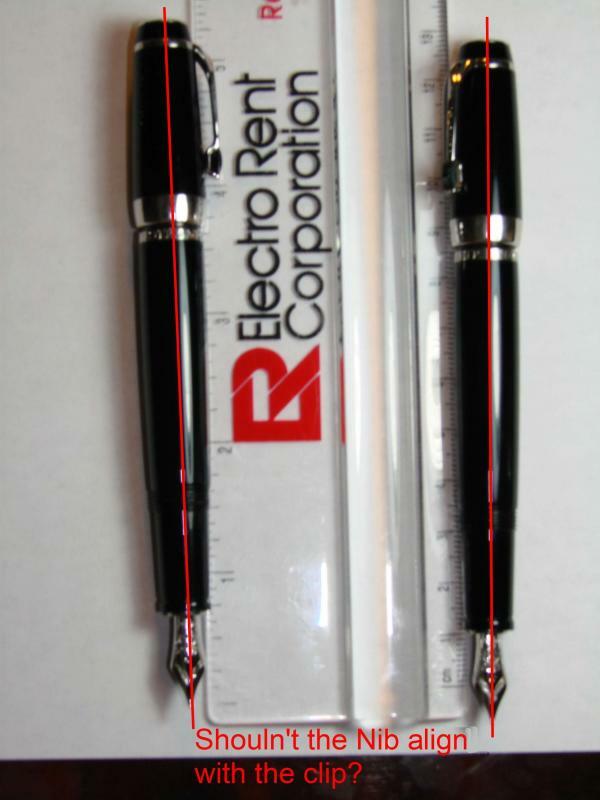 I will post pictures of my Noir et Noirs so that you can see what I am referring to and I would appreciate if you own a Noir et Noir or a Noir et Rouge or a Boheme with retractable nib, to post pictures of your pens posted to compare and see if the cap lines up with the nib. I know how helpful all of you are so thank you in advance for all your help! Sadly, I think that you did get a Mb technician who "is so carless and sloppy not to check to see if the pens post correctly." That's a shame. It would annoy me too, as these pens really need to be posted, and the clip would get in the way of you writing. If you can't get it to align properly, I would complain to Mb. However, they will need to have the pens back again, to fix them. They should offer to pay your shipping to send them though. Just a thought: You have tried swapping the caps to the other pen bodies have you? I am going to take your advice and contact MB... this will be ANOTHER 6 weeks without my Noirs and I love using these pens for college and note taking. I know a lot of people don't like the retractable nibs because of all the work it takes to write but when I'm taking continuous notes in class it doesn't bother me a bit. Besides the cap and nib not lining up, these pens are great! It really shouldn't be anything that takes 6 weeks; it should be something that could be fixed while you wait. Call the Boutique and ask if they have the tool to loosen the cap-nut and can align them while you wait. Yes but his boutique is a 4 hour drive away in St Petersburg. I have been to Florida, and there aren't many Mb boutiques. I know there isn't one anywhere near Naples where I go. There is one in Tampa, and I assume one in Miami and Orlando. I'm sure they could be adjusted at one of these. However, as you have already been to St Pete maybe you might want to wait until you go back there. Whatever happens, I hope you get them sorted out. Please will you keep us posted and let us know? Not to many MB boutiques here in Florida. I will contact MB and keep you guys up to date on the resolution. But I really cant express enough how great the service was from the boutique, I spent quite a while there talking 'pens' with the sales professional and she even brought me back into the VIP room where they keep the real gems! I really had a great experience, just wish the tech who fixed my pens payed enough attention to detail as the rest. It sounds like you had a good time, and you're so lucky to live in Florida. I would give my right arm to do that. There's also a MB boutique in Palm Beach Gardens at the Gardens Mall. Mine doesn't line up if I turn it all the way. Mine looks like yours on the right hand picture. It's never bothered me. How To Score Vintage/discarded/nos Pens From Stores In India?